It’s been a while since I read a medical thriller. I used to gobble them up like candy, but you can overdose on these things pretty quickly (oh, yes, that pun was very much intended). Back in the day of Robin Cook’s Coma, there was something novel and terrifying about unethical doctors and science run amok. These days, in a saturated market, you need something pretty special to give your twisted hospital an edge. Sadly, Adrenaline just doesn’t have it. 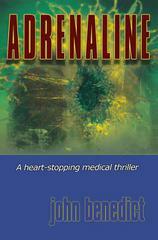 Adrenaline is the story of a group of anesthesiologists in a private practice that work with a single hospital. Our main character, Dr. Doug Landry, is an on-the-rise member of the group, probably destined to become its leader as the old guard begins to consider retirement. Everyone in the group works long hours, sometimes in less than ideal circumstances, and when patients begin having major anesthesia complications, it looks bad for everyone. The meat of the story has Doug and a quirky medical student slowly becoming aware that someone is tampering with their equipment, livelihoods, and patients’ lives. Okay, first a couple of good things. Author John Benedict is a physician and obviously knows his anesthesia, which is pretty interesting in terms of places medicine can go horribly wrong. It’s a great place to set a thriller. He also had his finger on the pulse of the changing financial world of medicine – in 2005 when the book was originally published. Unfortunately for him, things in that realm have changed a lot in the past decade and the struggles the team faces seem archaic in 2016. It’s tough to write a book that revolves around a rapidly changing field that maintains its relevance, and if you don’t know much about medical practices this might not bother you much. It drove me a little crazy. The book was reprinted in 2013 and should have had some updates. In addition to feeling dated, Adrenaline falls short in both plotting and character development. Benedict makes the mistake of having the reader know what’s happening before the characters, making them seem dense and clueless. He also has a couple of subplots that needed a lot of beefing up in order for the outcome of the mystery to have any punch. There’s also a bit of uneven pacing as characters spend more time than they should mulling over their personal dilemmas, something that doesn’t flesh out the characters as much as bore the reader. I didn’t actively dislike any of the characters (well, except the ones I was supposed to dislike) but it takes too much time for Landry to emerge as our primary protagonist. He’s also a relatively bland good guy but has some habits that could easily tip him into “I hate you” territory for some female readers. Hopefully in the next book (there is a sequel, published in 2013, called The Edge of Death) Benedict rounds out this central character and brings his group into the present. It takes place three years after Adrenaline, so he has given himself the opportunity to have circumstances change to better reflect the current state of health care. Overall, Adrenaline is not a bad book. It’s competently written and edited and the plot is within the realm of reasonable for a medical thriller. The uneven pacing, dated health care systems, poorly sketched subplots and underdeveloped main character all take away from the thrill of the hunt for the bad guy. I don’t recommend this one, but I would definitely be willing to give the sequel, The Edge of Death, a try to see if author Benedict has ironed out some of the wrinkles from this debut. Sue is an Editorial Manager at Silver Beacon Marketing who reads books, watches TV, over-mothers her nearly grown children and aspires to someday be the neighborhood Crazy Cat Lady.